The course Data Analysis with R is intended for Big Data analysts and scientists who want to use R to analyze their data and to make static analyzes. Experience with programming is beneficial for a good understanding but is not required. The theory is treated on the basis of presentations and examples. The concepts are explained with demos. The theory is interspersed with exercises and there is ample time to practice. R Studio is used as a development environment. The course times are from 9.30 to 16.30. The participants will receive an official certificate Data Analysis with R after successful completion of the course. 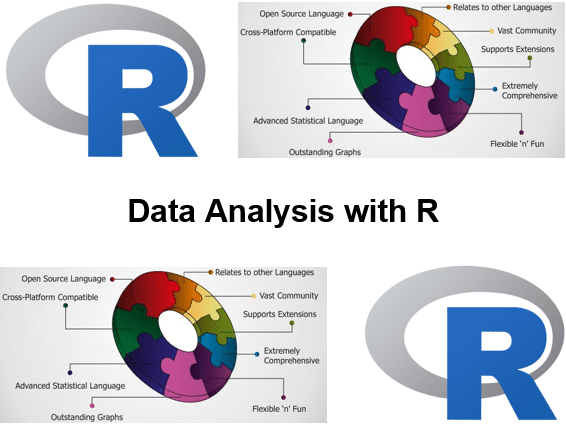 In the course Data Analysis with R you will learn programming in the language R and how you can use R for effective data analysis and visualization. R has become a standard platform for data analysis and making graphs and you can perform a huge set of statistical procedures that are not available in other statistical programs. You first learn how to install and configure R. Next you will learn how to quickly gain insight into the data by means of graphs and transformations. The input of data from different sources is treated. Also data types of R, such as vectors, arrays, matrices, lists, data frames and factors are discussed. As well as control flow in R with the family of apply functions. The course also discusses statistical analysis models such as linear and non-linear models, variable transformations and regressions. Finally, attention is paid to how to present results through graphs, reports or interactive dashboards. All this is explained with many practical examples and can also be applied to cases that are brought in by the course participants. dbplyr What is a model? How to evaluate a model? How to use a model?